This year, the home video divisions of all the major distributors banded together and plotted a full-scale assault on the wallets and bank accounts of Blu-ray owners during September and October. Only the wealthiest could possibly survive an attack that began with the first Hi-Def release of the Indiana Jones films. But the supreme weapon, the ultimate October Surprise, is Universal’s huge ebony slab of fear, nostalgia, and latex make-up: Universal Classic Monsters: The Essential Collection. Spanning twenty-three years and nine films (advertised as eight, sorry Spanish Dracula), the long-anticipated set brings the Masters of Halloween into glorious 1080p for the first time, and in perfect seasonal position to drain your money before you waste it on a Jack Sparrow costume that forty other people are also going to wear to that same party. Few movie series have had such an impact on filmmaking and popular culture as Universal’s stable of ghouls. They are as much a part of Halloween as Pixie Styx and pumpkin carving. I can’t imagine there are Blu-ray owners with any shred of geek cred out there who won’t want to add this to their shelves. When I received mine in the mail, I rejoiced at the anticipation of a week full of evenings revisiting some of my favorite movies in beautiful restored editions. The box set did not let me down—except for the one film that doesn’t really belong on it, but I anticipated that. Universal Classic Monsters: The Essential Collection comes packaged in a black slipcase with a side-bound color booklet of trivia. 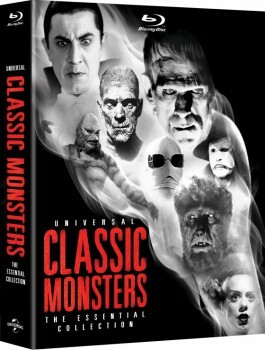 The eight discs contain Dracula (1931), the Spanish-language Dracula, Frankenstein, The Mummy, The Invisible Man, Bride of Frankenstein, The Wolf Man, the 1943 color re-make of The Phantom of the Opera, and Creature from the Black Lagoon. 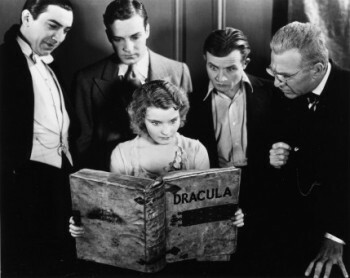 No film in the collection received a more thorough restoration than Tod Browning’s Dracula, the film that created the horror movie as a continuing genre. The extensive work (explained in a bonus featurette) paid off: Dracula is sumptuous on Blu-ray, and at times feels like it leaps off the screen in an imitation of 3D. During the first twenty minutes — the part people best remember from the film — the Gothic atmosphere becomes enveloping, and simple camera moves turn epic. The restorationists have not scrubbed up Dracula to look like a 2012 film, but they have made it look as good as it must have the first time it went through a projector gate at the movie theaters in February 1931. Dracula remains as flawed and creaky as the last twenty years of criticism have come to realize it is. The opening is movie magic, but once the story reaches Dr. Seward’s sanatorium, the film comes to a near-complete halt and never recovers from the stagy, bland presentation. There are still a few moments left to savor — Dracula confronting Van Helsing over the mirror, Renfield choosing to “take the stairs” — but all the negative stereotypes of early talkies are on display. Yet watching this Blu-ray was the most enjoyable time I have ever spent with the original Dracula, and Halloween would not be the same without some vintage Bela Lugosi. Dracula sports the best set of bonus features of the discs: the in-depth and forthright 1999 documentary, a half-hour piece on Lugosi’s career with a star-studded cast of horror legends weighing in, David J. Skal’s knowledge-packed and often brutally critical audio commentary, the Philip Glass score composed for the film in the 1990s (I prefer watching Dracula with this music), and a complete second film: the Spanish-language Dracula shot concurrently with the English-language version. Although the Spanish Dracula suffers from Lugosi-lessness, it is a more lively and creatively shot movie and contains scenes that never made the English cut. Amazing to think that the stodgy Dracula came out the same year as James Whale’s still vivid and gripping take on Frankenstein. I have always adored this movie, but it delivered a gut-punch on Blu-ray with the cleanest, most pristine transfer of the set. The film is so “Alive! Alive!” over eighty years later when shown this way that all age drops away from it and makes the overused term “timeless” mean something. 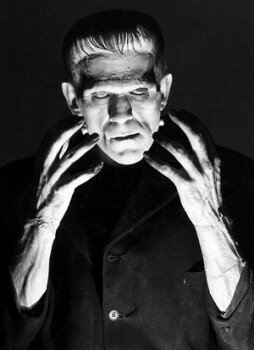 Karloff’s performance and Jack Pierce’s iconic make-up benefit enormously from the new detail: you want to stop to savor every moment the Monster is on screen. The sound mix is top-notch, and proves that a proper 2.0 Mono DTS Master Audio mix can have as much power and punch as a modern 7.1 showcase. Just the sound of the first clump of dirt striking the top of a coffin is enough to make you jump. Frankenstein uses sound sparsely (it has no music except over the beginning and end titles) and the mix exploits every thump of it. The bonus features include the standard 1999 documentary and a forty-minute documentary on Boris Karloff’s career to the parallel the one on Lugosi. The Mummy sports a softer transfer, as matches the hazier source material. It isn’t the revelation of Dracula or Frankenstein, but it is faithful in restoring the eighty-year-old movie’s image. The lethargic commentary by Paul M. Jensen from the earlier DVDs is still here, but Universal made the wise choice of offering a second commentary option: a group effort by Rick Baker and a round-robin of horror experts and collectors. The biographical documentary is on makeup wizard and anecdote-magnet Jack Pierce. There’s also a featurette about Universal Studios in general during the Carl Laemmle era, when the first monsters were born. The film that James Whale made to distract Universal from forcing a Frankenstein sequel on him. 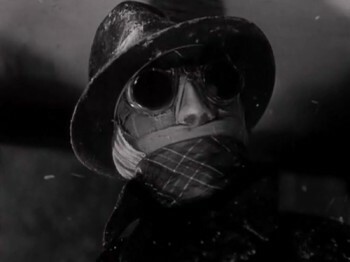 The Invisible Man doesn’t feel much like a horror film to us today, more like a science-fiction thriller, and has the least Gothic or Halloween aura of the 1930s classics. But it’s still a fun chase movie with stunning special effects, James Whale’s perfect British countryside comedy, and Claude Rains riveting viewers with merely his voice. The transfer is problematic: in the opening scenes, everything looks as pristine as on Frankenstein, but softness starts to drift in later — and not just on the optical effects shots, which naturally have more grain to them. A few scenes have a bizarre “smudge” effect as if the film got run sloppily through the heaviest noise reduction setting on Photoshop; it certainly does not come from the source. None of these ruin the experience, and the clarity on John Fulton’s special effects make them seem all the more astonishing, but this is the movie most in need of a second look from the restorers. The extras are slimmer, most from previous releases, plus a puff-piece about Universal’s “Unforgettable Characters,” which is just an eight-minute advertisement for the studio’s other catalogue titles. I’ve already gone on and on about this masterpiece. I don’t have much more to say about the greatest of Universal’s classic monster films, so I’ll turn to the disc details. The transfer contends with the first Frankenstein as the highlight of the collection. 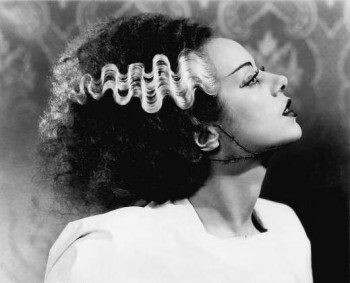 But Bride of Frankenstein has a more organic appearance, showing its age without revealing any damage. The film has a pleasing grain texture and painterly quality different from the stark look of Frankenstein. Viewers who want a perfectly pristine look won’t cheer over the transfer, but I think it’s as faithful as the restoration could get to what showed on cinema screens in 1935. The 2.0 Mono DTS-MA sound mix is excellent, which is especially good news for Bride of Frankenstein because of the famous musical score by Franz Waxman; no other movie in the set needed the sound restored as much, and Universal’s team delivered. There are no new supplements here except for a short piece on film restoration at Universal, although not Bride specifically. The old extras are among the best available in the set: a lengthy documentary on the movie and Scott MacQueen’s encyclopedic commentary. The six-year leap from Bride of Frankenstein to The Wolf Man covers a seismic shift at Universal; in 1936 the Laemmle family lost control of the studio after defaulting on a loan for Show Boat, and new owners took control. After ignoring horror films for a few years, Universal re-entered the business with Son of Frankenstein (1939) and revealed their crown jewel two years later with The Wolf Man. In a time when the classic monsters were getting shunted off to the B-picture units, The Wolf Man shines as a swanky effort with top of the line actors (Ralph Bellamy, Claude Rains) and great production design. 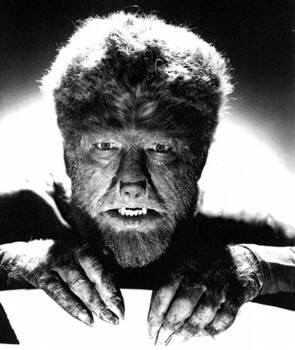 It launched Lon Chaney Jr. as a horror actor and gave him his signature role. The film does not reach the atmospheric or artistic heights of the James Whale era, but it is Universal’s finest offering from their second era of monsters. The transfer is solid work for a film that was already in good condition. The disc is packed with bonuses almost as dense as the Dracula disc (except no second film). Lon Chaney Jr. gets the documentary treatment, and this is the best of the biographical supplements in the set, dealing honestly and sometimes emotionally with Chaney’s turbulent life. For lore-lovers, a featurette explores the effect Carl Siodmak’s screenplay had on cementing the particulars of werewolf mythology; it’s astonishing how much of werewolf “legendry” originates from Siodmak’s typewriter. The misfit film. 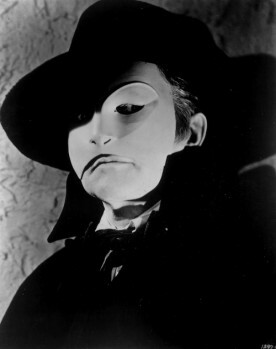 The Phantom is a classic Universal monster … but not this Phantom. The lurker beneath the Paris Opera House who most people think of is Lon Chaney Sr.’s disfigured organist from the 1925 silent movie. However, Universal doesn’t have exclusive home video rights to that version, and probably wouldn’t have packaged a silent film with the other classics anyway. So here’s the Technicolor version with Claude Rains instead, and it barely classifies as a horror film by any definition, then or now. It’s a romantic melodrama with too much opera and too little fear. The colors look good on the restoration, and if anyone cared much about hearing the eternal slog of opera sequences, the sound is pretty good too. Every movie box set is required by law to have a disc that gets played only once (or not at all), and Phantom ’43 takes the hit. Universal should have put Son of Frankenstein or Frankenstein Meets the Wolf Man in this slot. Actually, I might slip the disc back in some day, not to watch the feature film, but to enjoy the long documentary on “The Phantom” at Universal, which covers the fascinating behind-the-scenes drama on the 1925 movie and also looks at The Climax (a Boris Karloff film meant as a spiritual sequel to The Phantom ’43) and the Hammer Film Productions 1962 version, which Universal International co-financed. The documentary is one of the liveliest, and has the bonus of participation from (gasp!) actors from the original. 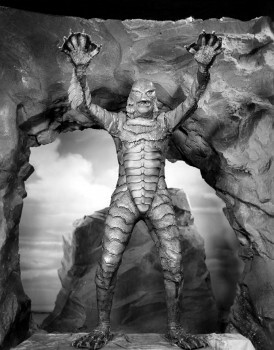 Yes, both gill-men — Ben Chapman (on land) and Ricou Browning (under the waves) — share their memories of squeezing into the amphibian suit. Ryan Harvey is one of the original bloggers for Black Gate, starting in 2008. He received the Writers of the Future Award for his short story “An Acolyte of Black Spires,” and his stories “The Sorrowless Thief” and “Stand at Dubun-Geb” are available in Black Gate online fiction. A further Ahn-Tarqa adventure, “Farewell to Tyrn”, is currently available as an e-book. Ryan lives in Los Angeles. Occasionally, people ask him to talk about Edgar Rice Burroughs or Godzilla in interviews. Great overview, both of the films themselves and the Blu-ray transfers. I picked up all of these films (except for ’43 Phantom, good call) ten years back on DVD. Best memory of them is watching Frankenstein in a theater last October. I was sitting in an audience of jaded 2011 fans who were laughing at the corny dialogue and painted backdrops … until Boris Karloff walked into the scene. Eighty years after the film was made, the entire audience still went dead silent at those close-ups. And you realize that James Whale did this on purpose, made the early part of the film over-dramatized and a bit silly so that, when the horror part kicked in, it really pulled the rug out from under you. I don’t own a Blu-ray player yet, but when I get one, it looks like I’ll need to buy these films once again. I’m a big fan of The Mummy. It’s such a beautiful movie and feels like “Dracula done right” in some respects. I’m actually not as high on Bride of Frankenstein as many people, but that’s probably because I think Whale’s jokey tendencies get a little out of hand there. I find that the more I watch Son of Frankenstein, the more I gravitate toward it as my favorite Frankenstein sequel. > This set cost plenty as it is. The same set is available from Amazon.co.uk for less than 1/2 the price of the US release, including the shipping cost (it was $55 after the currency exchange when I ordered it). It’s a region free release, so there are no worries about disc/player compatibility issues, and better packaging on the UK set as well, to avoid scratching the discs. I purchased my 2 weeks ago over here in Germany. And what’s completely insane is that it only costs €40.00 over her!! That’s $52.40!! Less than half the stateside price. It’s usualy the other way around that stufdf like this is much more expensive in euro land than in the states. It made me happy as hell though! My one complaint (and it’s minor) is that they didn’t include all of the sequel movies that were originally part of the Legacy collections — Son of Frankenstein, Werewolf of London, the various Black Lagoon sequels, etc., etc. — which means I need to keep my Legacy DVD’s. But then I remember that most of those movies weren’t actually very good.